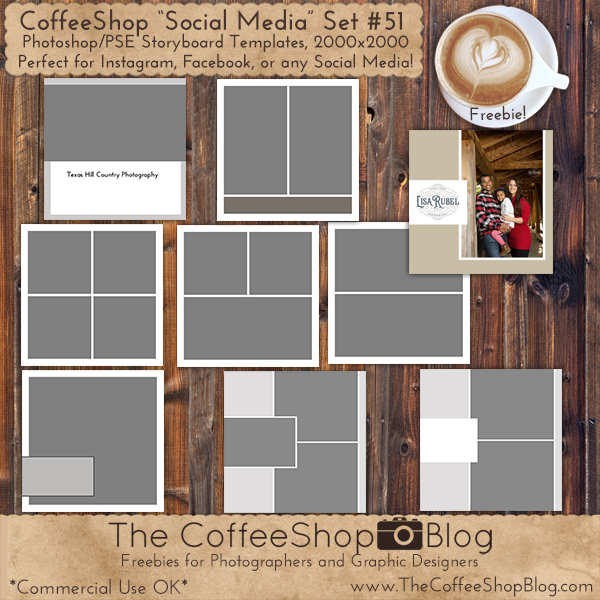 The CoffeeShop Blog: CoffeeShop "Social Media" Storyboard Set #51! CoffeeShop "Social Media" Storyboard Set #51! My grandmother's service yesterday was beautiful and it was so good to be around family and friends. And with Thanksgiving and Christmas coming up, I will have plenty of time to spend with my family which is wonderful. Nothing cheers me up like being around loving family and friends. Today I wanted to share a large set of square social media storyboard templates. These storyboards would be perfect to post on Instagram, Facebook, blogs, websites, etc. You can add text/logo to the text boxes, add a nice digital paper/texture background, and customize the colors. These are layered psd files for Photoshop/PSE so you can use my nifty action to load your images. You can also flip them before adding your images so can have many more photo options. A special thanks to Lisa Rubel Photography (website, Facebook, Instagram, Twitter) for allowing me to use her beautiful image in my example storyboard. Download the CoffeeShop "Social Media" Storyboard Set #51.